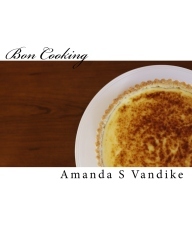 It’s my 3rd anniversary as a blogger for BonCooking, and I wanted to share something easy, quick and sweet with you. I know, I know – you don’t cheat! But this is one pie worth cheating a little for. So the part of the pie I’m referring to as a cheater – is the crust. Yes, you could make your own cookie crumb crust, but it can be time consuming, and you might have a bunch of other things to do.. so instead you can cheat, and buy a Cookie Crust in a pie pan, in any flavor you like (maybe you aren’t a fan of a chocolate base). Then all you need to worry about is making the oh-so-difficult PB PIE filling. In a a large metal bowl, stir confectioners’ sugar and peanut butter into crumbles. Set aside 1/2 cup, and place the rest in crust. In a 4 quart saucepan, whisk together salt, brown sugar, cornstarch, yolks, and milk. Bring to a simmer over medium heat and cook until custard thickens, about 1–2 minutes. Remove from heat and whisk in butter and 3 teaspoons vanilla. Pour custard over crumbles and smooth over, chill for at least 1 hour. Whisk together 1 teaspoon vanilla, heavy cream, and sugar to stiff peaks, spread over pie. Sprinkle the 1/2 cup of reserved crumbles on top of pie and serve. I guarantee this pie will not last long in your home. My student (in the photo) loved this recipe because he claimed he could make it Sunday night to enjoy it the rest of the week…well he made one Sunday night, and had none left for Monday night. I’m not sure if this is actually Persian rice, or if it’s just what my uncle called it because he’s Persian – haha. Either way, it’s delicious, sweet and nutty, takes time, and can be eaten by the bowl, basically it’s dangerous! Yes, I said sweet and nutty, which is why I recommend you serve it with lamb or beef kabobs, which bring the savory aspect. Spread pistachios and almonds on a rimmed baking sheet and toast until golden brown, 5–8 minutes, let cool. Coarsely chop and set nuts aside. Rinse the rice under cold water until it runs clear. Cook in a large saucepan of boiling salted water (4 cups), stirring occasionally, until grains have lengthened but are still firm, 6–7 minutes; drain and rinse under cold water. Spread rice on a rimmed baking sheet and let cool. Meanwhile, zest an orange. Bring sugar and 1 cup water to a boil in a medium saucepan, stirring to dissolve sugar. Add the orange zest and carrots, reduce heat, and simmer, stirring occasionally, until carrots are tender, about 15–20 minutes; drain, discard syrup, and set aside. Combine cranberries and raisins in a small bowl and cover with hot water; let soak 10 minutes. Drain and set aside. Place saffron in another small bowl, add 1/4 cup hot water, and set aside. Heat butter and 1 tablespoon oil in a large saute pan over medium heat. Add the onions, season with salt, and cook, stir often, until soft and beginning to brown, about 8–10 minutes. Add cardamom, cumin, turmeric, and 1 tablespoon saffron mixture. Cook, stirring constantly, until fragrant, about 1 minute. Reduce the heat to low, add cranberries and raisins, continue to cook, stir often, for about 3 minutes. Stir in the nuts, orange zest and carrot mixture, season to taste with salt. Set fruit and nut mixture aside. Heat remaining 3 tablespoons oil in a large wide heavy pot over medium heat. Add half of rice, spreading evenly; top with fruit and nut mixture, then remaining rice, spreading evenly. Using the end of a wooden spoon, poke 5–6 holes in rice all the way through to bottom of pot, this will help release the steam so the rice can cook evenly. Cook until saucepan begins to steam, about 5–8 minutes. Reduce the heat to very low and cook, without stirring, until rice is tender and bottom layer of rice is browned and crisp, 30–40 minutes. To serve, scoop rice into a wide serving bowl, or on a hot silver tray. Break bottom crust into pieces, you want to make sure everyone gets a bit of this when they are served. You can serve this with kabobs, like my uncle used to. I recommend marinating the beef kabobs in 3 tablespoons soy sauce and 1 tablespoon pomegranate sauce for 2 hours. While enjoying a bowl of this with friends, I couldn’t help but tell stories of all the picnics with 50 sum relatives in parks, and the loud Turkish music they would blare while getting together to dance. The tables were lined up, so that everyone could display their dishes, and we could grab food buffet style before sitting down with relatives I had just seen weeks earlier (at another park picnic). They certainly knew how to make you feel like it had been too long. It’s the 4th of July, and we have rain…this put a damper on our grill out for 2. Then John claimed he wanted eggplant lasagna, but not a heavy one…so I switched things around – eggplant was the base, and only 2 layers of noodles. Combine Parmesan and mozzarella in a bowl, set aside. Slice eggplant lengthwise, heat olive oil over medium-low heat. Season eggplant with salt and pepper, cook until softened and browned. Drain on paper towel. Spread 1/2 cup tomato sauce on the bottom of a 13 by 9 inch baking dish. Layer cooked eggplant, slightly overlapping, over the sauce. Sprinkle with cheese mixture. Layer with pasta, slightly over lapping. Top with 1/2 cup tomato sauce, and repeat layering with eggplant, cheese, and noodles. Finally top with 1/2 cup tomato sauce, the remaining eggplant and cheese. Bake covered for 30 minutes. Uncover, and bake until lasagna top is browned, about 15 minutes. Let stand at room temperature for 10 minutes before serving. My neighbors kids (ages 8 and 12) came by for dinner, while their parents went out – they helped me put it together, and LOVED it, they even took leftovers home.